It’s spring. The flowers are starting to bloom, the trees are showing signs of reawakening, and the promise of summer lingers in the air. A girl can’t help wanting to join in the fun by bringing a touch of spring to her own front door. But there are a few exceptions to my anti-wreath decorating philosophy: Christmas and springtime. Recently, I was at a major retailer and saw this cherry blossom wreath selling for $50. Overcome with my excitement for this harbinger of spring, I scooped up the thing and headed for the register. I was nearly there when it struck me. Why am I paying a retailer for something that I can easily make for half what they’re charging? 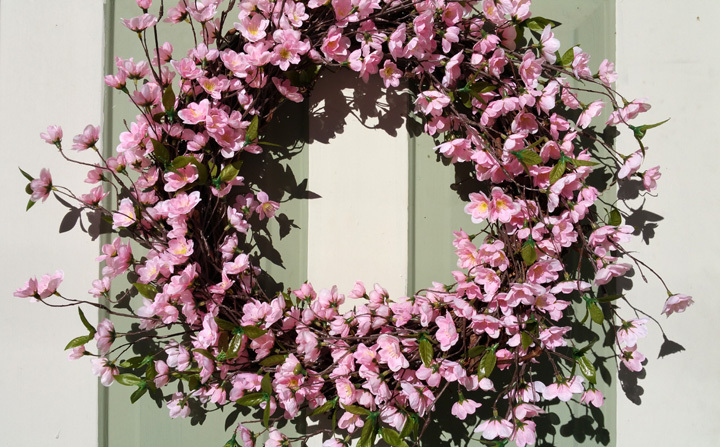 Here is my version of the springtime cherry blossom wreath, and the steps to make it yourself. Start with a grapevine wreath. I used an 18″ wreath that I got at my local craft store for $5, but you can use whatever wreath you have. And if you can’t find a new one in a craft store, just raid your mom’s basement – I’m sure there are plenty hiding in shame down there. Grab your glue gun and make sure it’s good and hot. Disassemble each bunch so stems can be added to the wreath individually. I used wire cutters for this. I learned early in life NEVER to use the “good” fabric scissors for cutting plastic or metal. Begin adding the stems to the wreath one at a time. I like to have them extend beyond the wreath so there’s a little more dimension to the finished design. It might be helpful to count how many stems you have, and then pre-place them evenly around the wreath so it doesn’t end up lop-sided. When all the stems are placed, hang your finished masterpiece in a place of honor. I prefer hanging it on the front door, so all who enter have no choice but to gaze upon my brilliant thriftiness. And now I leave you with this springtime poem I wrote when I was six years old. Copyright © 2018. A Single Girl's Guide To... | Website by: BizzwithBuzz, Inc.